Season 27 will start this Sunday, with the premiere episode Every Man’s Dream, and EA thoughtfully added some new stuff to promote it. 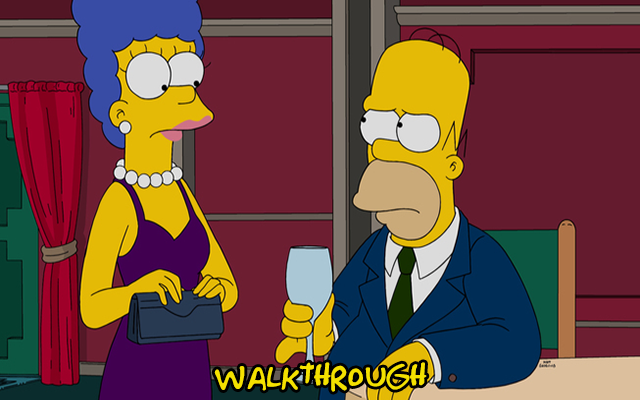 Find out what’s wrong with Homer right after the jump in the walkthrough of the tie-in questline! Once you log in the game, the main questline starts, with Homer… sleeping. It’s 6 in the evening, Homer! Well, it’s 9 AM somewhere. Please Homer, I’m just worried about you. Maybe you should see a doctor. Okay. But I’m only going for the lollipop after. I’m sorry. I was just so tired from all the sleeping I was doing earlier. Not like Flanders — he’s totally a snitch. No Dad, it’s a medical condition. You really should go see that doctor. Well, I’m not doing both. What’s closer, the hospital or the pharmacy? The pharmacy hasn’t been built yet. Well, build it close. In the meantime I’m going to take a nap. At this point, the tie-in’s building is unlocked and can be placed, and a new, never-seen-before (unless you’re following our article on all Season 27 spoilers) face appears, Candace, unfortunatly only on dialogue. Hey pharmacist, I’m here to pick up some “vitamins” for my angelic son… by which I mean ADD meds to keep him from setting fire to things. One lazy parent’s special coming up. My whole name?! How about just my initials… and let’s pretend I have no last name. Wow, Bart’s medicine kept me awake all day AND made me super-productive. Which means if I took ten of them I’d do eleven times as much work! Or 1024 times as much, if it’s multiplicative instead of additive. I feel great! It’s all so amazing. I can see colors! Aw, you’re such a handsome fellow. I just want to rub your belly! Wha–?! Are you talking to me? No buddy, she’s talking to me. I’m in the perfect state of mind to work at the nuclear power plant. I’m not Mr. Burns! I’m the manifestation of all your fears and insecurities. I might look scary, but follow me and I will show you enlightenment. Pfft. I’m not going to take orders from a figment of my imagination. You work the gut. I’ll pee on his leg! Jeez, Homer looks like he’s in pretty rough shape. You think we should do something? I heard if you die while you’re on drugs, you die in real life! System Message: A giant idol of Mr. Burns is now available in the store! See what the birds think of this monolith. Oh. But he’s not hurt now, right? System Message: Tune in to this week’s Simpsons to see if Homer really is narcolepsy free. Sunday 8/7 Central on FOX! 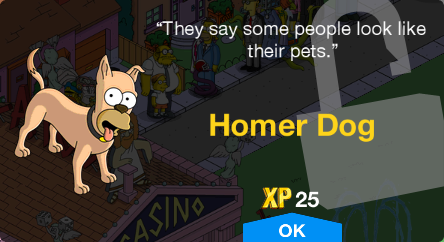 A new quite curious character appears in the game now: Homer Dog, just before the questline ends, promoting this Sunday’s episode! As you saw, after completing Pt. 1 and Pt. 6, two new permanent visual tasks unlocked for Homer, but this update brought us many new jobs for many characters that you can check in the What Changed post! In this update a new decorations is available in the store, and will give you 800 REV points for Springfield Heights, though having Springfield Heights opened is not required, as the REV points will transfer once you unlock the expansion. This decoration unlocks a new questline. Ah, sir, I’m not sure that’s actually possible. Well, quit dilly-dallying and find a solution. An entire species of birds isn’t going to eradicate itself. It’s done, sir. The pigeons are all… uh… gone. This is all for now, join us later for more info on this update, happy tapping! 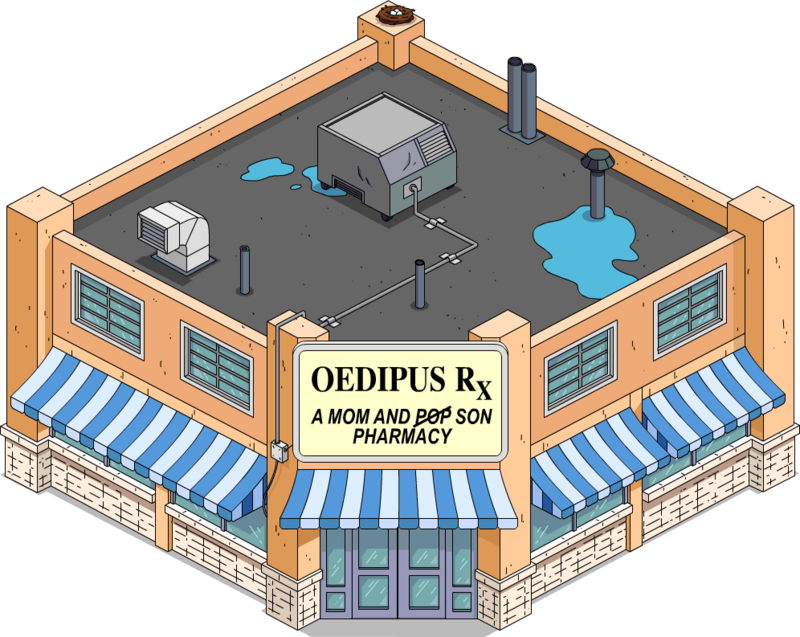 My Oedipous RX building disappeared when it was building?! Anyone else had that problem/know how to fix it? Next The IRS and the Job Manager are live!